When it comes to buying drones, we understand having a budget, and we certainly understand that you want to get into flying quadcopters and other fun drones without breaking the bank. To this end, we took some time to think about the drones that should prove worth your time, and all for under $100. In this case we mean ‘cheap’ as in inexpensive, so here they are, the best cheap drones. For our regular readers, this list has been broken out from our Cheap drones guide – see that list if you want some tips on how to fly. I know we’ve mentioned this, our Cheap drones guide is our unofficial quadcopter flying guide. It’s packed full of tips and tricks to help the first time pilot understand what drones are all about, what they are capable of doing and what obstacles you will face to get into the air. 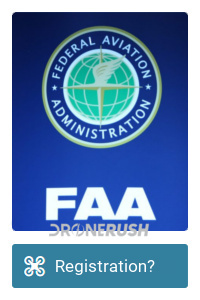 If you are buying your first drone today, I urge you to check out our guide before you buy. Good news for you, we have been building best drone lists to help you figure out what to spend your hard earned money on. 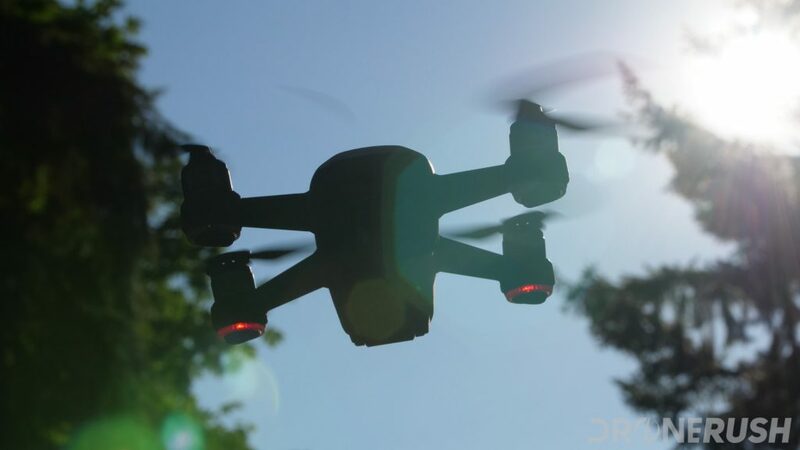 We have a big list of the best consumer grade drones, regardless price, we have a list of great drones in the under $500 group, and more, but today we are keeping things to the very affordable under $100 range. With that, let’s take a look at the drones! Getting into the ‘toy’ range here, the Hubsan X4 H107L is a fairly entry level drone great for those learning to fly or that are not in need of a robust machine to take to the skies. 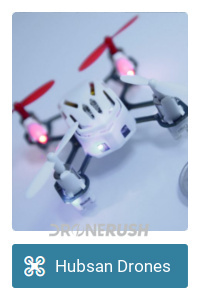 Also great for those with very little time on their hands, this little drone has no camera, cannot carry the GoPro and has battery enough for about 5-10 minutes of flight, depending on how you push it. 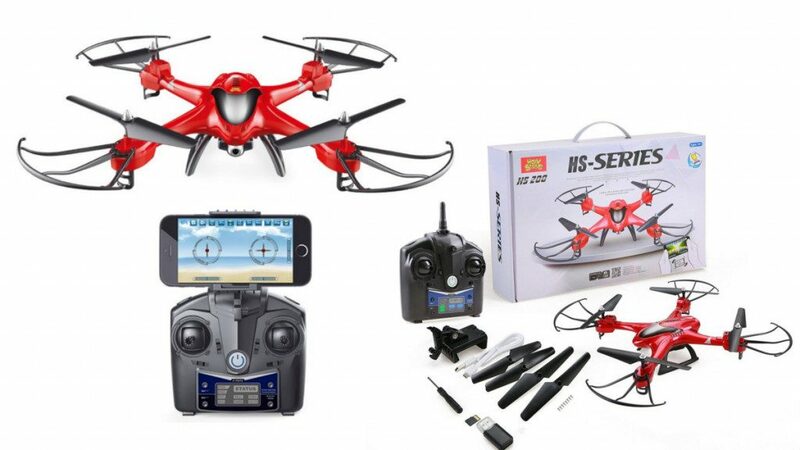 As a seemingly pointless drone as compared to the powerful camera and racing rigs on our lists, we all have to start somewhere, and the Hubsan X4 H107L for $22 on Amazon sounds like a smart price to do so. The White version is on sale for $16 right now, get in there before the sale ends. 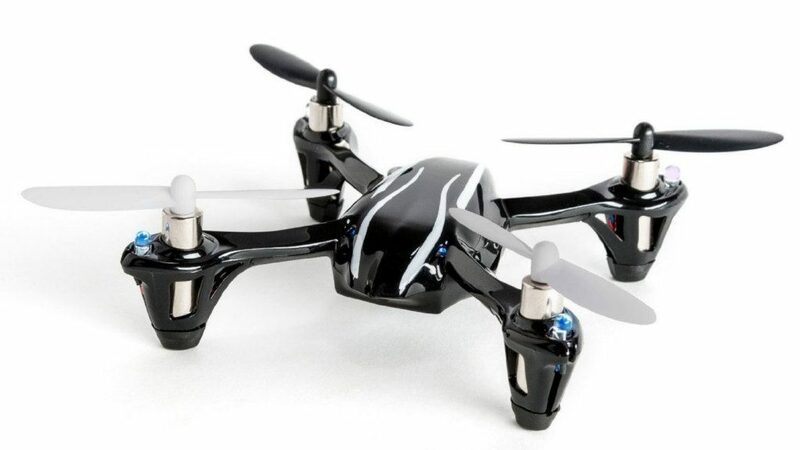 Sticking to toy caliber drones, the Syma X5C is a solid offering for the beginning drone enthusiast. 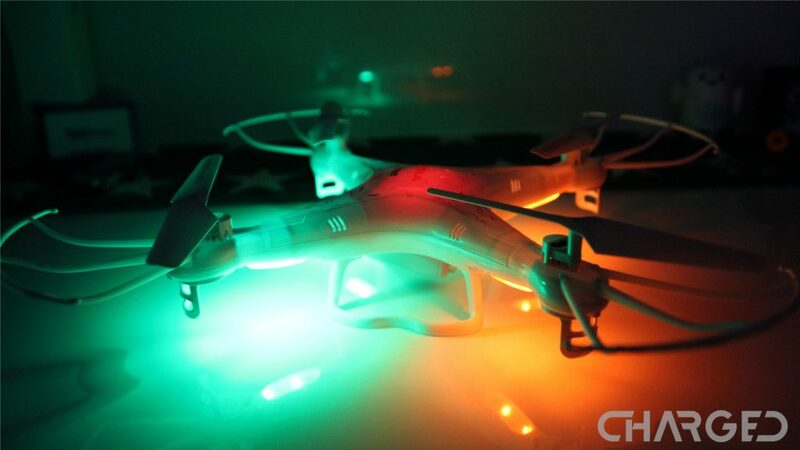 8 minutes of flight can be had while flipping, spinning and capturing a bit of video on the 720p camera. There is even bright LED lights for night flight. Rather, check your local laws for night flight rules, but hey, there’s bright lights, so, it’s up to you. Grab the basic model for about $40, or bump up to the explorer kit, with replacement parts and extra batteries for $45 on Amazon today. Update: Check out the new Tello Iron Man Edition. There is a common misconception that Tello is a DJI drone, this is not true. However, the Ryze Tello is made up of many DJI parts and is sold through the DJI Store, so we can understand the confusion. 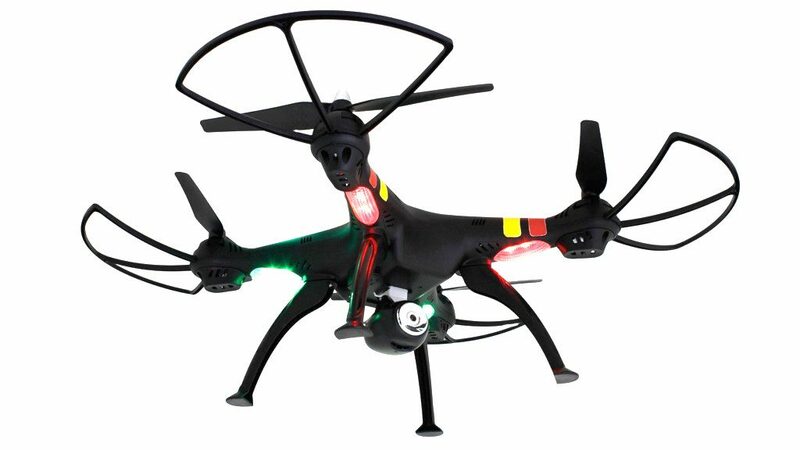 This is a toy class drone with a 5MP, 720p camera, vision system for a stable hover and some fun features. The best gimmick of this drone is the ability to toss it into the air to launch. It’s a fun little machine, but it is still a toy. Check out the Ryze Tello for $99 today to fly using your phone, jump up to $129 for Ryze Tello with Remote. Adding a new term to the mix, the Syma X8C Venture is a slight bump up from the X5C, including more substantial landing gear, a bit slower flight operation and headless flight. They call it Intelligent Orientation Control, but let’s not kid ourselves, it’s just headless flight. 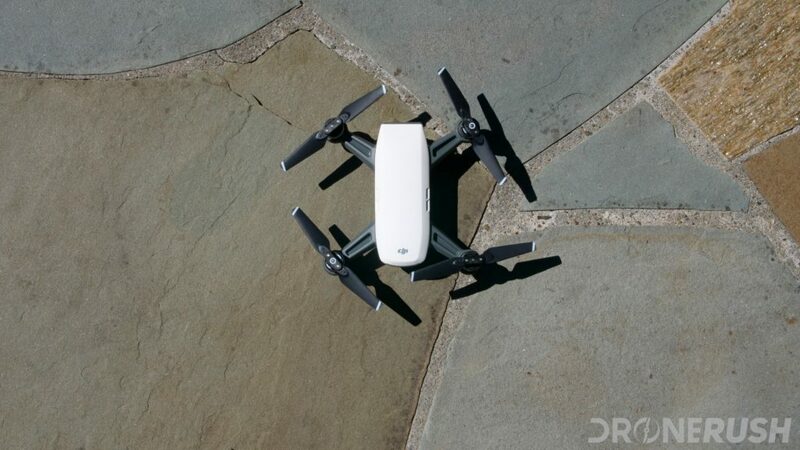 This drone is a bit larger than the X5C, but offers up very similar flight times, despite the much larger 2000mAh battery, and the same basic functionality and accessories. 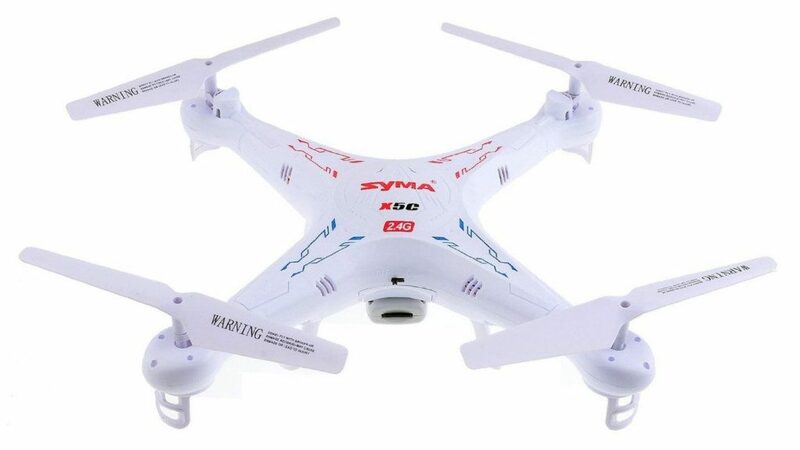 Check out the Syma X8C Venture for $70 on Amazon today. 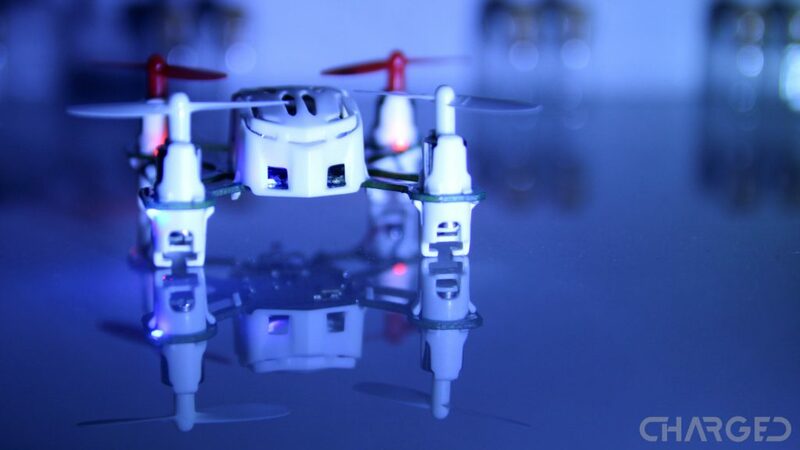 Using a familiar basic body and craft as many other toy drones, Holy Stone has added a batch of smarts and called their version the HS200 FPV. If we have not covered this yet, FPV is short for First Person View, which is when a drone live streams its camera view back to a display in your hands. So, take the toy drone, add headless mode flight, FPV, altitude hold and a return to home feature, and you’ve got the Holy Stone HS200 FPV quadcopter. 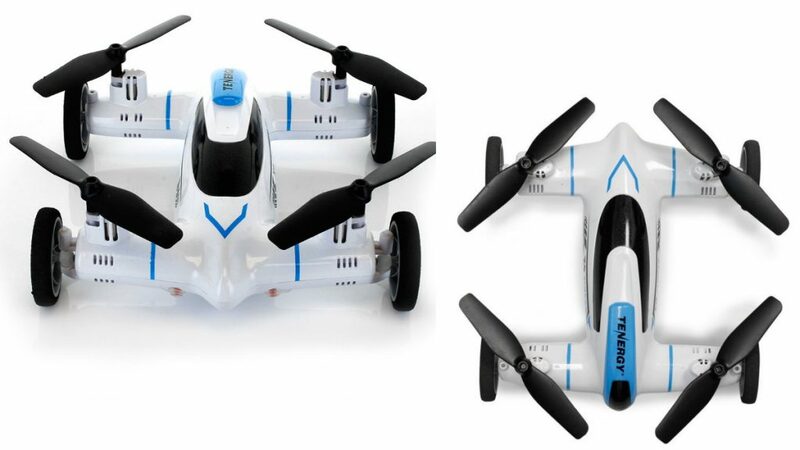 Check out the Holy Stone HS200 FPV drone for $99 on Amazon. For many in the hobby community, Blade is a favorite brand, with little micro quads in the Inductrix line. The versatile little quad has been put to use in a few ways now, the latest of which is a VTOL craft, of sorts, that is safe to fly indoors. Best suited for larger rooms, but still, safe indoors. The bent quad provides a slight forward attitude hover, and when you get moving fast enough, the wings take over and keep the machine aloft. 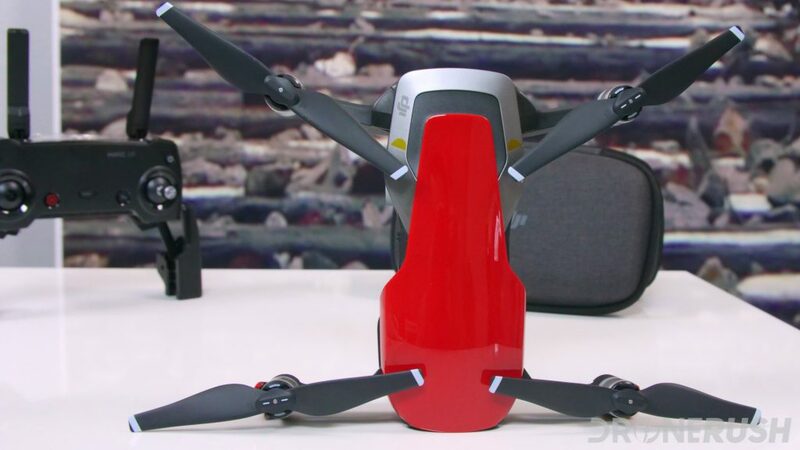 From what we hear, the wings help in turns more than they actually ‘fly’ the drone, but hey, we are intrigued by this design, and the whole kit and experience can be had for a very low price, all things considered. 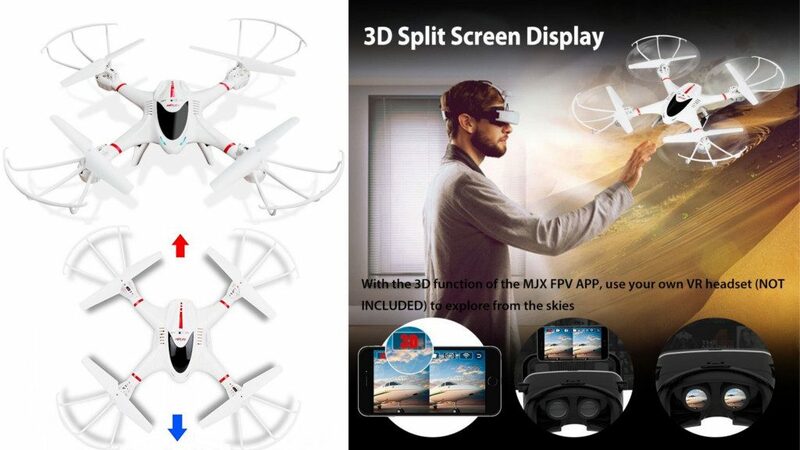 Compatible with VR goggles, this is another FPV flyer. Offering up remote control or control by smartphone, the DBPower UDI U818A is a little less capable than the U842, but offers a smoother flight for better aerial footage. The live video stream works up to 100 feet away and can be viewed on your smartphone, just place your phone in the holder on the remote control for easy usage. Check out the DBPower UDI U818A for $99 on Amazon today. It’s usually around $80, watch for deals. 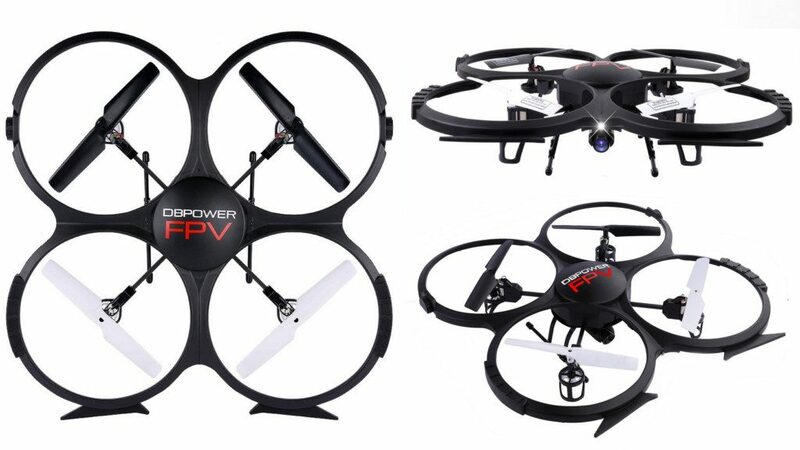 Adding some aerobatics to the mix, the DBPower MJX X400W FPV drone with 3D VR headset capabilities is another step down from a previous item in this list today. This quadcopter keeps things simple, giving you a great flying and learning experience with up to 9 minutes of flight time per charge and headless mode flight. 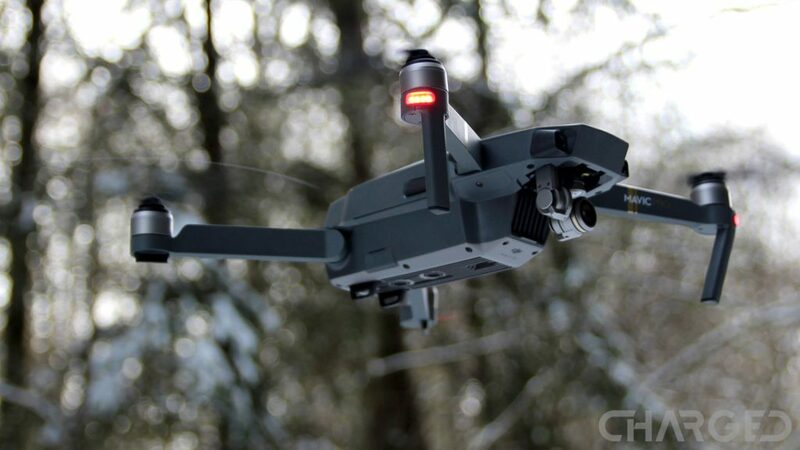 The DJI Mavic Air takes some of the best features that you’ll see in the Mavic Pro below, and improves on them. Also, if you’ve seen the smaller DJI Spark, the Mavic Air takes and improves on features from that as well. Basically, as I write this in February 2018, the DJI Mavic Air is the best, most portable and safest small drone from DJI. 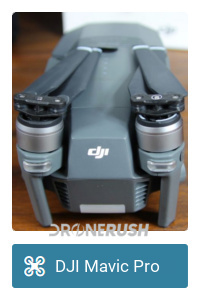 I’m not saying that that makes it the best drone on the market, but the debate is there. Check out the DJI Mavic Air for $729, or we recommend the DJI Mavic Air Fly More combo for $874 to get extra batteries and more. After flying the DJI Mavic Pro for a couple months now, it occurs to me that it is one of the easiest and safest quadcopters in the sky. Thing is, it is so easy, the flight controls so good, that you really do not learn anything flying it. If it will be the only drone you ever fly, you may skip the trainers that we’ve discussed today, but if you plan to fly others, please do start with an inexpensive toy. The DJI Mavic Pro is not, by any means, a cheap drone. It is ten times more expensive than the drones we are talking about today, but it is a spectacular flying machine, we just wanted to make sure you had heard of it. Look to spend $875 on the base Mavic Pro or $1,129 for the Fly More bundle on Amazon. Regular price is $999 and $1299. Is the DJI Mavic Pro still worth it? If you were here looking for a gift for a young one, perhaps a non-flying drone? 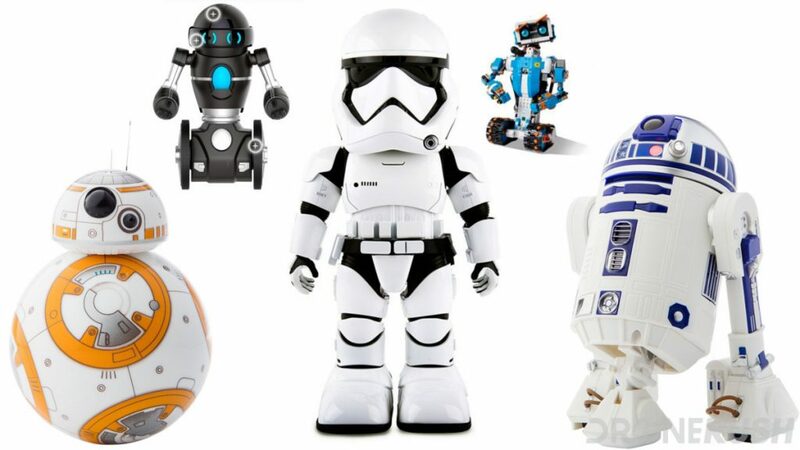 No beating around the bush, there is only one flying drone on this list, but the rest are drones, of a sort, land based drones… They’re robots, but you know what, they’re fun robots that we want to play with too. That’s the end of our list. Other than actually taking the controls, I hope you’ve found most all of the particulars that you require to get your first quadcopter into the air. Do not be afraid of them, but do treat them with respect. Do not go too fast with them, learn the basics and ensure that you have your drone for years to come. Finally, there is no point spending a ton of money on your first craft, get one of these little toy class trainers to learn the basics of flight. You’ll be the master of the air in no time. Do you have a favorite drone for under $100 that you’d recommend?